FIGURE 2.8. 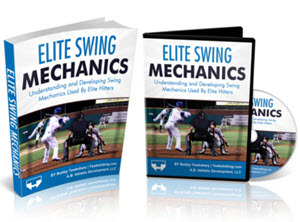 A 21-year-old collegiate baseball player with acute onset of right hip pain doing squats. 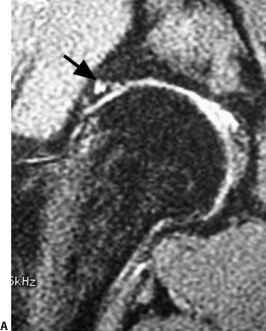 (A) Coronal MRI image demonstrates evidence of labral pathology (arrow). (B) Arthroscopic view demonstrates labral pathology (arrows). (C) As the labrum is debrided, associated articular damage at the articular labral junction is uncovered (arrows). were performed (Figure 2.8C) with prompt symptomatic resolution.